What are risk factors for shoulder bursitis? What are shoulder bursitis symptoms and signs? How is shoulder bursitis diagnosed? What are treatments for shoulder bursitis? Are there home remedies for shoulder bursitis? What is the prognosis for shoulder bursitis? Is it possible to prevent shoulder bursitis? What health care specialties treat shoulder bursitis? A bursa is a tiny fluid-filled sac that functions as a gliding surface to reduce friction between tissues of the body. The plural of bursa is bursae. There are 160 bursae in the body. The major bursae are located adjacent to the tendons near the large joints, such as the shoulders, elbows, hips, and knees. Bursitis is inflammation of a bursa. 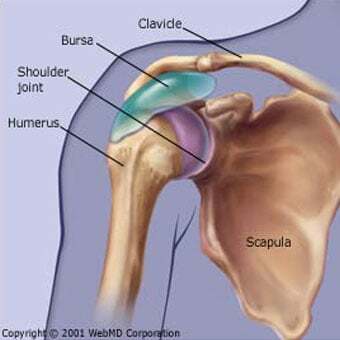 Injury or inflammation of a bursa around the shoulder joint causes shoulder bursitis. A bursa can become inflamed from injury, infection (rare in the shoulder), or an underlying rheumatic condition. Examples include infection of the bursa in front of the knee from a knee scraping on asphalt (septic prepatellar bursitis), inflammation of the elbow bursa from gout crystals (gouty olecranon bursitis), or injury as subtle as lifting a bag of groceries into the car, which could inflame the shoulder bursa and lead to shoulder bursitis. Injury or strain to the shoulder joint causes shoulder bursitis. Activities that are common risk factors for shoulder bursitis include throwing a ball, lifting objects overhead, and trauma from a fall onto the shoulder. Treatment for bursitis depends on the underlying cause. Rest, Ice, Compression, and Elevation (RICE) is one strategy to decrease the symptoms of bursitis. Pain and swelling may be managed with nonsteroidal anti-inflammatory drugs (NSAIDs). If the bursa is very swollen, the doctor may drain excess fluid. Corticosteroids injected into the affected bursa are sometimes used to decrease inflammation. The doctor may recommend the use of a cane, splint, brace, or other support to reduce stress on the affected joint. In some cases, physical therapy may be ordered to help strengthen the area and encourage improved mobility. Bursitis is typically identified by localized pain or swelling, tenderness, and pain with motion of the tissues in the affected area. X-ray testing can sometimes detect calcifications in the bursa when bursitis has been chronic or recurrent. MRI scanning (magnetic resonance imaging) can also define bursitis. Shoulder bursitis is often accompanied by tendinitis of tendons adjacent to the affected bursa in the shoulder. Shoulder bursitis causes focal tenderness of the inflamed tissues. It can also cause a "pinching" pain when the elbow is moved away from the body, referred to as an "impingement" sign. Sometimes shoulder bursitis requires aspiration of the bursa fluid. This procedure involves removal of the fluid with a needle and syringe under sterile conditions and can be performed in the doctor's office. Often the fluid is sent to the laboratory for further analysis. 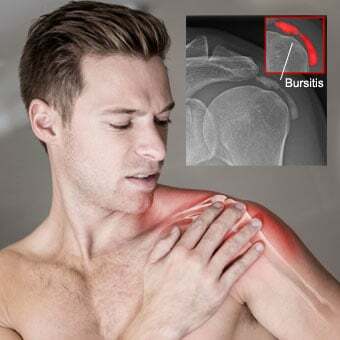 Noninfectious shoulder bursitis can also be treated with an injection of cortisone medication into the swollen bursa. This is typically done at the same time as the aspiration procedure. 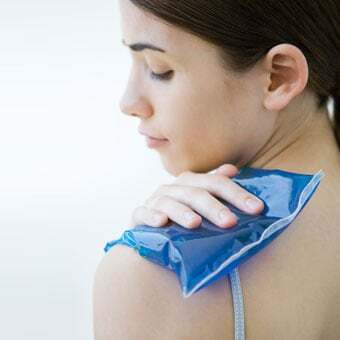 Physical therapy can be used to aid the recovery from bursitis, especially when it is accompanied by a frozen shoulder. Infectious (septic) bursitis, which is uncommon in the shoulder, requires even further evaluation and aggressive treatment. The bursal fluid can be examined in the laboratory to identify the microbes causing the infection. Septic bursitis requires antibiotic therapy, sometimes intravenously. Repeated aspiration of the inflamed fluid may be required. Surgical drainage and removal of the infected bursa sac (bursectomy) may also be necessary. Generally, the adjacent joint functions normally after the surgical wound heals. Bursitis is initially treated with ice compresses, rest, and anti-inflammatory and pain medications. The outlook for shoulder bursitis is generally excellent for a full recovery with shoulder bursitis. If the bursitis is accompanied by scarring around the shoulder joint (adhesive capsulitis or "frozen shoulder"), it can require long-term physical therapy. By avoiding overuse of the shoulder by excessive straining the shoulder and gradual exercise training, shoulder bursitis can be prevented. Specialists that treat shoulder bursitis include general medicine physicians, including general practitioners, family medicine doctors, and internists, as well as orthopedic surgeons, rheumatologists, and sports medicine specialists. Often physical therapists and rehabilitation physicians are involved in the care of shoulder bursitis. What were the symptoms of your shoulder bursitis? Please describe your experience with shoulder bursitis. What kinds of treatment did you receive for your shoulder bursitis? Were they effective? Please share suggestions for preventing shoulder strain and bursitis. Calcific bursitis is the calcification of the bursa caused by chronic inflammation of the bursa. Calcific bursitis most commonly occurs in the shoulder. Calcific bursitis treatment includes medication for inflammation, ice, immobilization, cortisone injections, and occasionally surgical removal of the inflamed bursa. Impingement syndrome is a condition that affects the shoulder. Symptoms include pain with overhead use of the arm, difficulty reaching up behind the back, and weak shoulder muscles. Treatment involves taking NSAIDs for approximately eight weeks, daily stretching in a warm shower, and avoiding repetitive activities with the injured arm. Nonsteroidal antiinflammatory drugs (NSAIDs) are prescribed medications for the treatment of inflammatory conditions. Examples of NSAIDs include aspirin, ibuprofen, naproxen, and more. One common side effect of NSAIDs is peptic ulcer (ulcers of the esophagus, stomach, or duodenum). Side effects, drug interactions, warnings and precautions, and patient safety information should be reviewed prior to taking NSAIDs. Pseudogout, a form of arthritis, results when deposits of crystals collect in and around the joints. Symptoms of pseudogout include pain, stiffness, warmth, and joint swelling of the knees, ankles, hips, shoulders, and/or wrists. Treatment for pseudogout aims to decrease inflammation through the use of nonsteroidal anti-inflammatory drugs, ice, and rest.